GALION — On Oct. 5, members of the Galion High School publications class — Katie Keller, Jared Dixon, Ian Stinehour, Matt Sparks, Erica Eidt, Danielle Schneider, Elizabeth Wolf and Jada Myers — along with yearbook advisers, Cay Faulkner and Violeta Chinni, attended a yearbook training program at the Findlay Inn & Conference Center in Findlay,. The workshop, organized by Herff Jones publishers, offered a number of sessions pertaining to the yearbook theme selection, layout and design, photography and photo editing, and the use of latest applications to augment the yearbook experience. Students also were offered a variety of resources, including free yearbook samples for research and inspiration. “This workshop contained sessions valuable to novices and veterans of the class,” said Cay Faulkner, an English teacher and GHS yearbook adviser. “From basic page layout ideas to augmented reality, the students explored fresh ideas combined with the importance of maintaining traditional historic content. 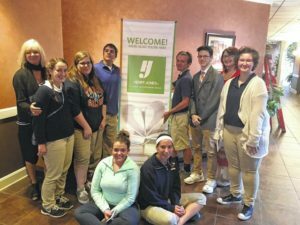 “As an English teacher and yearbook advisor, it is wonderful that Herff Jones provides teaching tools aligned with our curriculum and content standards. Their resources can light the spark that turns ideas into something truly remarkable,” said Faulkner. Participating students took something valuable from the workshop and will use it when designing the 2017 Galion yearbook. “I really enjoyed learning about ‘trendy’ design elements, which can be included in our theme to create a feeling of the era,” said Elizabeth Wolf, a second-year member or the yearbook staff. On the other hand, for first-year staff member Ian Stinehour, it was all about acquiring new skills. “I learned photography techniques, as well eDesign tips to help during layout,” said Stinehour. Aside from offering valuable learning sessions for students, the workshop included many tools and resources for yearbook advisers. Galion City Schools’ yearbook is called “The Spy.” It is a student publication, managed and produced by high school students. Student staff members take approximately 40,000 digital photos each year, write stories and captions and design and edit pages. To order a copy of the 2017 Spy Yearbook online, go to www.yearbookordercenter.com, and enter order No. 12125; or order directly at the high school. It costs $60.00 (add-ons are available at extra cost). Make checks payable to GHS Spy and submit to Mrs. Faulkner or Ms. Chinni at the high school.